Three Principles for Managingand Avoidingthe Problems of GrowthWhy is profitable growth so hard to achieve and sustain? Most executives manage their companies as if the solution to that problem lies in the external environment: find an attractive market, formulate the right strategy, win new customers. But when Bain & Company’s Chris Zook and James Allen, authors of the bestselling Profit from the Core, researched this question, they found that when companies fail to achieve their growth targets, 90 percent of the time the root causes are internal, not externalincreasing distance from the front lines, loss of accountability, proliferating processes and bureaucracy, to name only a few. What’s more, companies experience a set of predictable internal crises, at predictable stages, as they grow. Even for healthy companies, these crises, if not managed properly, stifle the ability to grow furtherand can actively lead to decline.The key insight from Zook and Allen’s research is that managing these choke points requires a founder’s mentality”behaviors typically embodied by a bold, ambitious founderto restore speed, focus, and connection to customers: An insurgent’s clear mission and purpose An unambiguous owner mindset A relentless obsession with the front lineBased on the authors’ decade-long study of companies in more than forty countries, The Founder’s Mentality demonstrates the strong relationship between these three traits in companies of all kindsnot just start-upsand their ability to sustain performance. 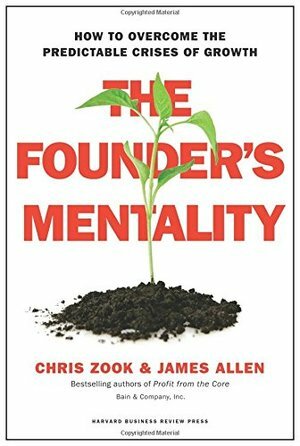 Through rich analysis and inspiring examples, this book shows how any leadernot only a foundercan instill and leverage a founder’s mentality throughout their organization and find lasting, profitable growth.